Wedding Photography - Purchase or Investment? I know people often wonder how Wedding Photographers work, what goes into creating the perfect wedding coverage, and what goes on behind-the-scenes. I found this interesting infographic while trawling the web the other day, that might be interesting to anyone with an interest in wedding photography. Weddings are awesome, fun-filled events where you can proclaim your love to the whole world, surrounded by those you love the most. Wedding planning, however, is synonymous with stress. When you're planning one of the biggest days of your life it can be very easy to become overwhelmed by all the vendors competing for your time and custom. There are many different types of wedding vendors but because I am a wedding photographer, I'm going to talk about photographers specifically. What should you look for when you want to hire a photographer? What are the pitfalls that await the unsuspecting bride and groom? Read on, and I'll go through five questions you should ask yourself, and of any potential photographer, before you put your money down. Do I like their style? If you don't like the style of photographs that a particular photographer produces, it's a bad idea to hire them. This is probably obvious, but it bears repeating. If you don't like their style, you won't be happy with hiring a particular photographer. How do they use colour, are the photos vibrant or more restrained? Are they very modern or does their style have more of a retro feel to it? Do they use a lot of shallow depth of field/blurry backgrounds, and do I like that? What type of photographer are they? There are plenty of different types of wedding photographer, but two broad methods among them. Pay close attention when you talk to a wedding photographer or visit their website to their use of terms. Reportage refers specifically to a more journalistic style (hence reportage - reporter) with a focus on candid photos of people enjoying themselves with the photographer generally trying to stay out of the way as much as possible. Traditional wedding photography is generally more nebulous, but generally has emphasis on posed portraiture. Lots of photographers (myself included) do a mixture of these, but there are some photographers who will only really do one or the other, so be careful when you book. If you want fabulous bridal portraits you may be disappointed if you hired a reportage photographer. Likewise, if you want special candid moments you might not want to choose a more traditional photographer. What type of person are they? This is one you might miss, but it can have an impact. If you're a very energetic group then a photographer who is quite low-key and reserved might struggle to provide what you're looking for. On the other hand, if your group is quite restrained and conservative, a photographer who's the human equivalent of a bouncy ball might grate on you. This one is only particularly useful if you met the photographer at a wedding fair; it's hard to tell someone's personality solely through text on a website, so bear that in mind. Are they equipped for what I'm asking of them? Wedding photography is a tough field to work in, and while I'm definitely not interested in being a gear prescriptivist, there are a few things you should look out for. Their main work camera ought to be a DSLR or a Mirrorless camera with interchangeable lenses. There are of course other cameras that fall outside of this particular rule (Fuji X100's, for example). They should realistically have two DSLRs, or a DSLR and a mirrorless/high end compact as a back-up. If their camera goes kaput during your wedding if they don't have something to fall back on, you'll get no pictures and be rather peeved. It doesn't happen often, but why take that chance? If you want portraits with off-camera lighting you should ask them whether they're capable of providing that before it comes to the big day. They probably won't be as equipped as this cosmonaut! How are they going to provide me with my pictures? This varies quite a bit from photographer to photographer. Some photographers are perfectly happy to hand over printable digital files on a USB stick or DVD as part of their package (this is what I do), whilst others might hold back their digital files as an added extra. If you get digital files of your wedding coverage and intend to print them, ask the photographer if they will be in a hi-res 300dpi format. If they aren't you will struggle to print them any larger than a beermat. Likewise, if you intend to print them you should ensure that your photographer will provide you with a print license. You might think that you can just pop down to Boots and get photos printed however you like, but with wedding photos the staff will sometimes ask you to provide proof that you're legally entitled to print the pictures you want. This is because by copyright law, photographers retain all rights to the images they make, even when working for a client. Other photographers will prefer to give you a printed product after your wedding, an album for example (I do this as well! ), with additional prints/canvases/wall art available to buy direct from the photographer. This has its pros in that photographers who are willing to sell you prints after will often charge less to cover a wedding in the first place, and the quality will be higher as we have access to professional print labs and suppliers. The cons of this model is that photographers will expect you to buy something and therefore be very keen in selling to you. Some photographers will not provide digital files at all, some photographers will only provide digital files, make sure you know which one you want before you commit to a deposit. Those are my five questions couples need to ask themselves when it comes to booking a photographer for their wedding. I hope they prove useful to you when it comes to making this difficult decision, and makes planning your wedding just a little bit easier. One of the most frustrating and inhibitive parts of being involved in photography is gear. It is our bane and our joy, a source of endless aggravation and a focus of insatiable lust. The manufacturers know this, of course, they're well aware that you'd commando crawl over hot coals to get your eager hands on their latest fancy offering. We all know deep down that keeping up with Joneses is a mug's game and yet we throw ourselves into it without even realising it. I am thoroughly guilty of all of these problems, but I like to think I have some measure of self-awareness about it. At least a part of this relentless desire towards acquiring 'better' equipment is a quixotic search for a magic bullet. I have lost count of the number of times I've thought to myself, in some quiet and darkened corner of my mind, “If only I had <x>, then my photography would really move to another level.” A new lens (I don't have *that* focal length yet! ), a better body (this one shoots at 6fps rather than 5.5! ), lights (JoeyL uses these ones! ), modifiers, studio gear, accessories (this SD card says it's for professionals so I need that one). It is a ravenous money pit that has no end, no matter how much of your hard-earned currency you toss into its gaping maw, it's still hungry. We all know deep-down that none of this is truly necessary and that what we have is just fine for our purposes. Yet still the thoughts and lust occupies that corner of our mind that deals with hedonist desire. Speaking of hedonism, there is a principle known as the 'cycle of hedonism' that serves as a good explanation for why we behave this way. When you first buy a 'luxury' (for whatever value of luxury) product, it's the best thing ever. It's better than anything you've ever experienced, you can't believe you were lucky enough to acquire this amazing, beautiful thing. As a few weeks pass and you become accustomed to it, it's still a pretty good thing, and you're very happy with it. Perhaps not as ecstatic as you were when you got it, but you still like it a lot. Months down the line and the thing is just your thing, you don't feel any strong emotions about it one way or another, it just is, and then your eye starts to wander to the newest thing. This thing does things your thing could never do, it's a colour you really like, it's not that much more expensive than the thing you already have but it's so much better. Eventually you crumble and get the new thing and the cycle repeats itself once again. Photography is an art-form (though there are some Guardian art commentators who dispute that) but many of its adherents treat it more like golf. Go on a photography forum and you probably won't have to click more than twice before you stumble into it. Men (and it is always men) of a certain age comparing their equipment and arguing the merits of their particular purchases over their associates', when you read you get the sinking feeling that it's not so much photography as golf-players who spend all their time debating which driver is best rather than perfecting their swing. Photographers disdainful of this practise derisively label these folk 'All the gear, but no idea', they spend so much time arguing about camera equipment that they forget why they wanted to do photography in the first place. Don't be like that. Artists don't spend their days arguing with one another about whose brush has the most bristles or who among them has the sharpest chisel. Don't waste your precious time on this planet arguing about cameras on the internet. The worst part of this is that it doesn't matter, not even a little bit. There is no magic bullet, no 'essential purchase that'll make your photography amazing with no effort expended'. Once you pass a certain threshold of gear, that of acquiring a 'decent' beginners camera, the only ways to get better are through practise and study. Experiment with your camera and see what it can do. Take risks and embrace your failures, encounter each failure as an opportunity to learn and improve. Learn how to take control and process your images in your computer. Read and watch lots of tutorials and absorb the knowledge of those who came before you. Look at the photographs of photographers you admire (and those that you don't) and try to identify what makes them 'good' and then attempt to incoporate the elements you like into your own shooting. Henri Cartier-Bresson famously said “Your first ten thousand photographs are your worst.” Don't you think it's time you got started? Street photography has a long and storied history, sitting as it does at the intersection of journalism and art. 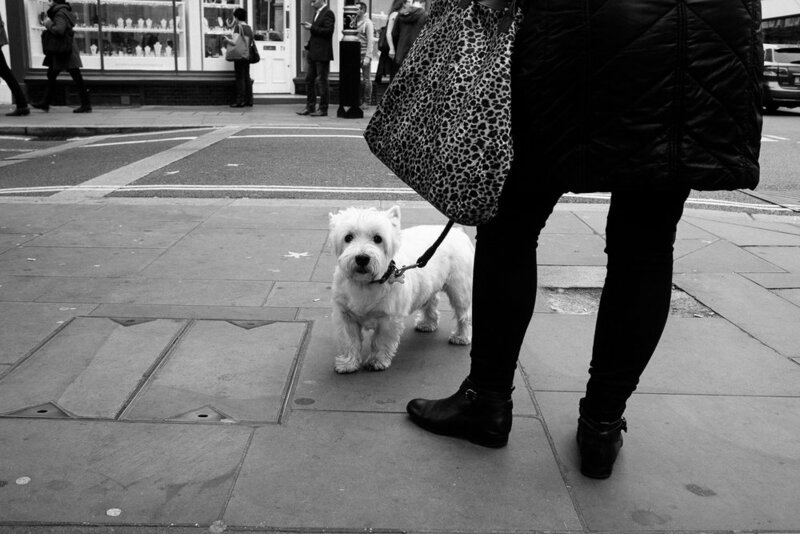 My interest was drawn to it by the figure that has inspired many budding street shooters, Henri Cartier-Bresson. Probably the most broadly influential street photographer in the medium's history, Cartier-Bresson was an advocate of stealth and discretion. He would famously use only small Leica cameras painted black to avoid drawing attention to himself. Other street photographers use different methods and equipment but the intention usually remained constant: to discretely find and catch people off-guard, wherein the oft-discussed 'decisive moment' makes itself known. The ethical considerations of the medium are one of its most controversial aspects. Defenders of the form often fall into arguing that people have no right to expectation of privacy in a public place, and that street photography is legal. The fault with this reasoning is that just because something is legal doesn't make it particularly ethical. As my friend Phoebe put it: “Legality is pretty much the minimum of human behaviour. That's right at the baseline.” No-one wants to feel harrassed or as though a shifty-looking stranger is surveilling them on the street. In fact, a year or two ago I stumbled upon a photographer sharing his street work on Facebook, all seemingly distant photos taken voyeuristically from a car with a cheap camera. Needless to say, the response to the anonymous photographer's attempt to be creative was not positive. With the explosion of online photo-sharing and the creeping growth of sites encouraging people to photograph strangers to shame them for their behaviour (remember Women Who Eat On Tubes?) or to objectify and demean them, public sentiment against street photography seems to be slipping even further into the negative. Although voyeurism and shaming are nothing to do with street photography itself, benign street photographers have by-and-large been embarrassingly unsuccessful in preventing the predators from claiming the justification of 'art' for themselves. I used to be a voracious street photographer. I'd roam around town for hours trying to find something interesting happening, eagerly hunting down that decisive moment. When I got the chance to go to New York for a day a few years ago I dove in head-first and spent the day hunting around for things to photograph. In such a rich ground it felt like there was something happening everywhere I looked. Unfortunately it feels as though those days have slipped into the past. More and more when I'm out on the street with a camera, for each shot I manage to take I can feel myself 'miss' ten others. The growing anxiety at potentially causing upset, potentially being thought a creep or pervert causes me to hesitate, and in that hesitation the opportunity passes by. I've lost my nerve, and I'm not sure I'll ever get it back.